While I watch in envy at the custom crafted consoles, I don't have the time or money to do that right now. 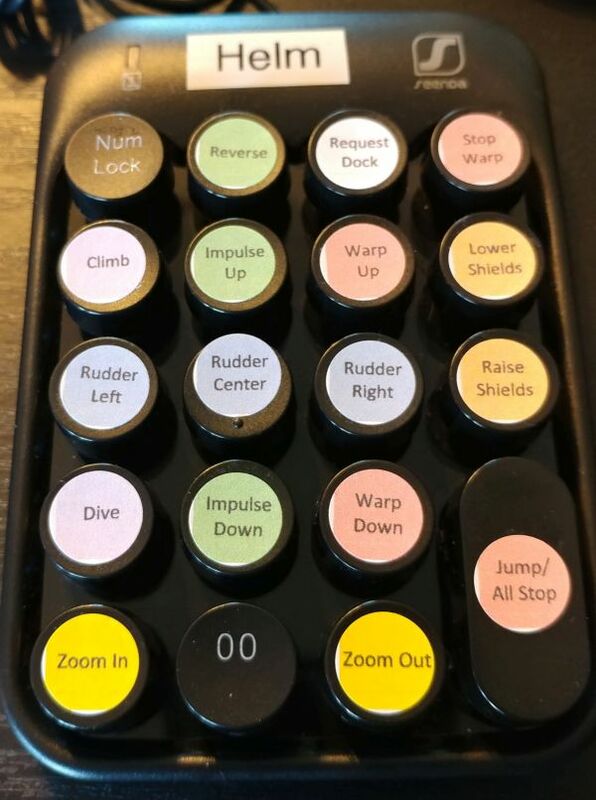 So I thought I would try to come up with an inexpensive method for making custom, labeled controls. My goal was to make it easier for new players to pick things up (e.g. 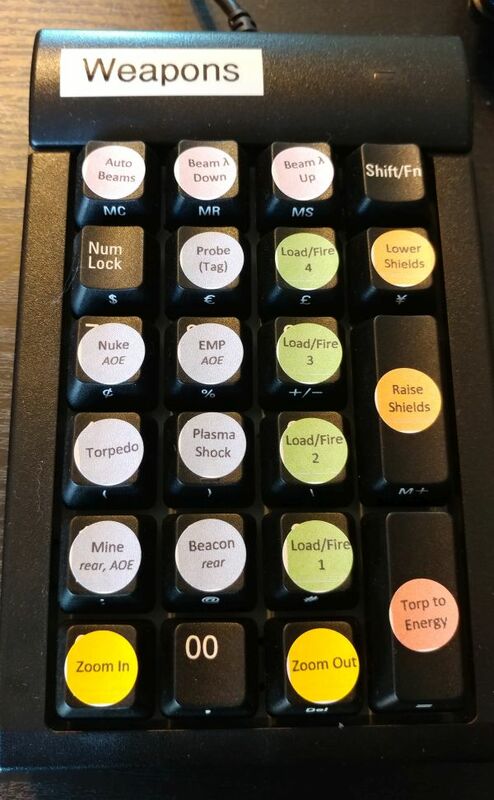 having a button labeled "Nuke" or "Reverse") and just improve the usability and production values a touch. 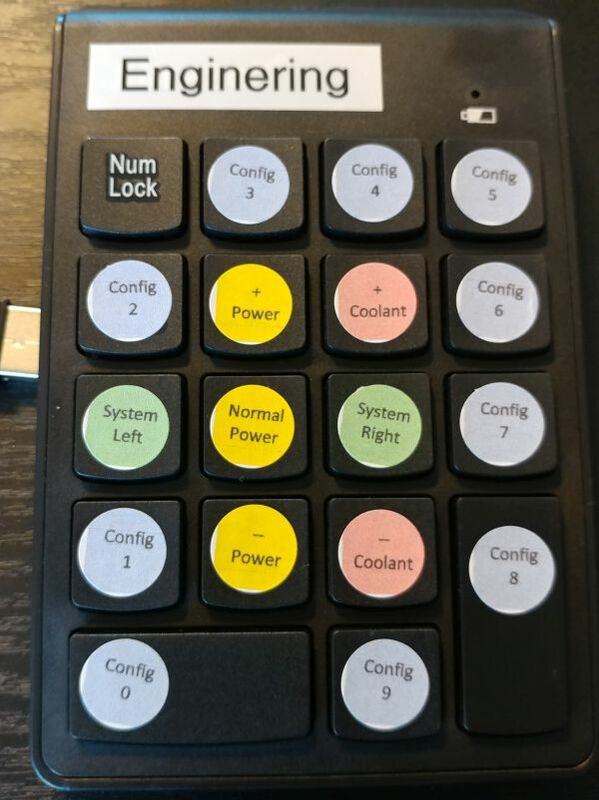 The big idea is to take an accessory keypad and some small stickers (along with customizing the controls.ini) to make labeled buttons that don't rely on overlays or marking up the laptop keyboard. 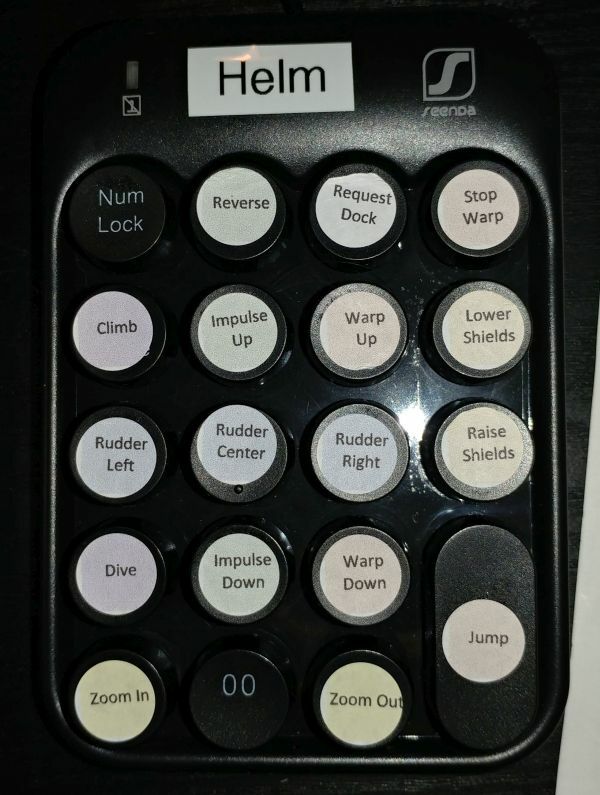 I found this inexpensive USB keypad for $5 (19 keys, 17 usable) and these printable stickers for $5 just the right size for keys. You could get really swanky and upgrade to a wireless keypad for $11. There are also cool ones with backlit keys. Then you print onto the stickers, clean the keys with a cloth damp with rubbing alcohol (to ensure a good stick), and carefully stick the stickers onto your keys. I attached my planning sheet and sticker template below, along with the controls.ini file in case anyone wants a shortcut. As you can see these are a bit rough as the print alignment is tricky on stickers that small (it takes a couple trial prints to get everything just so). It's also tricky to place the stickers perfectly straight, but I got better over time. It didn't come out very visible, but I did color coding as well so all of the rudder controls are blue and all of the impulse controls are green, etc. -- it definitely improves readability (see the keyboard mapping attachment below). Spend some time test printing one sticker at a time to align the sticker sheet with your printer. Just move the top and left margins around to adjust things. You can feed the same sheet through multiple times. While you can technically map controls to Num Lock and Shift/Fn keys, you shouldn't. Also, on my particular 24 key keypad, the shift key is processed on the keypad and is different from the main keyboard Shift. Don't use it or things get confusing. I couldn't find a way to map to the "00" (double zero) key. Because of these two things, don't count on a 19 key keypad holding 19 controls (I got 17). 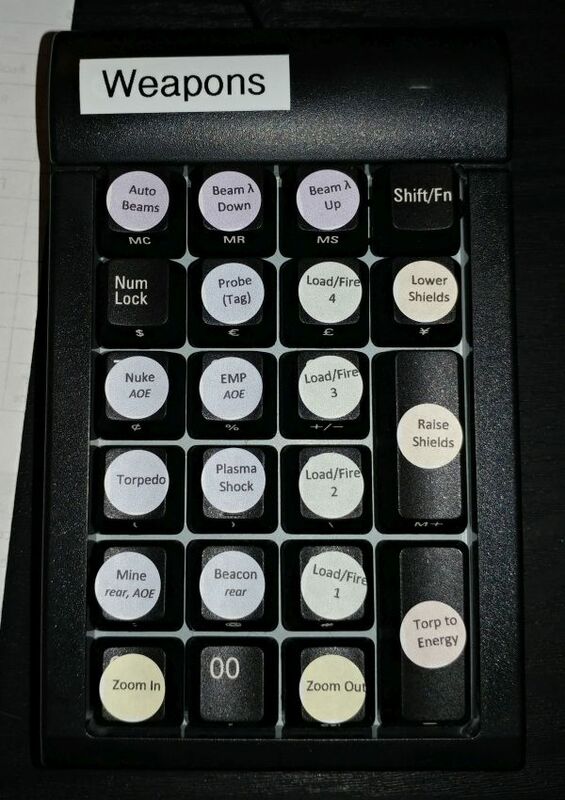 For weapons, I went with a 24 key keypad and still had to leave off seldom-used controls (like unload tube). In the controls.ini file, the keyboard's UI_INPUT_KEY_1 is different from the keypad's UI_INPUT_NUMPAD1. 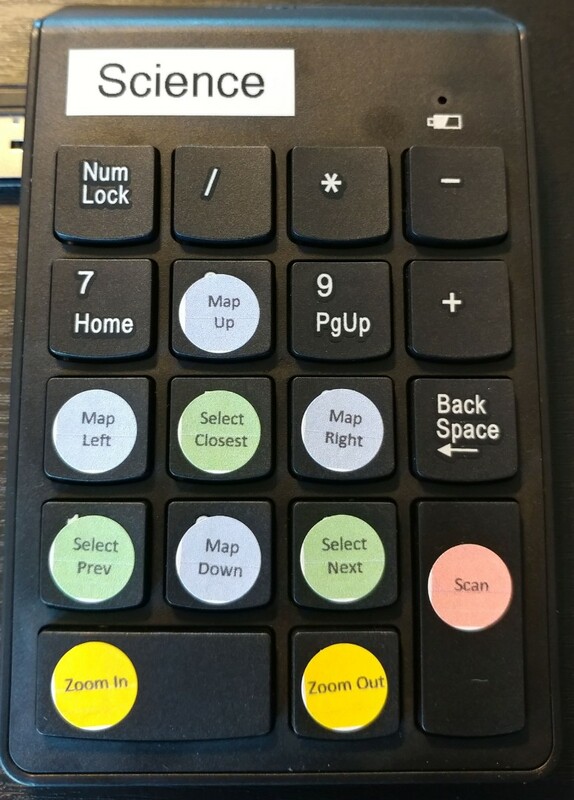 This let me keep the standard keyboard controls intact while moving around the keypad's (e.g. it might be 1 on the keyboard and 7 on the keypad). Make sure the NumLock light on the keypad is on or else the custom controls won't work (and it gets very confusing as they become arrow, end, and home buttons). Update to the keypad controls. I've made the colors more distinct for a little user interface improvement as well as added controls for Science and Engineering. 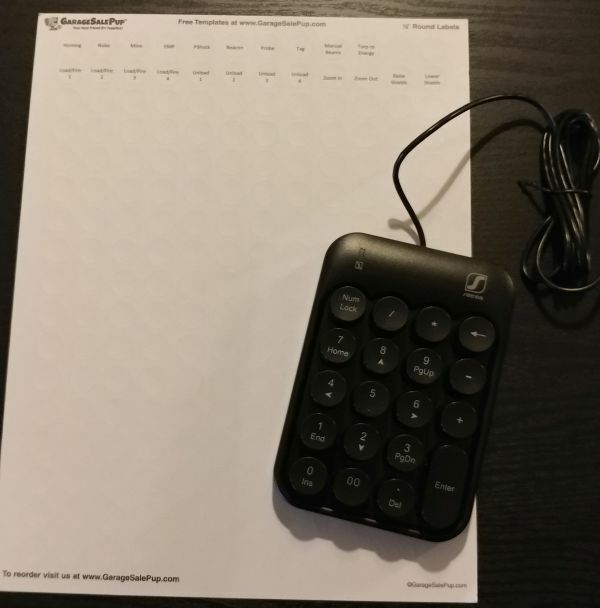 I tried getting $10 wireless keypads for the science and engineering to try a different hardware. They all work nicely and I can't wait to try them with new players. I've uploaded updated stickers and controls.ini file. Very nice! This is about the level I might manage.